Your neighbor’s on vacation for two weeks, so you might want to check on the flowers. How hard can that be, right? But after watering it twice the favourite orchid is gone and even the cactus doesn’t show any sign of life anymore. 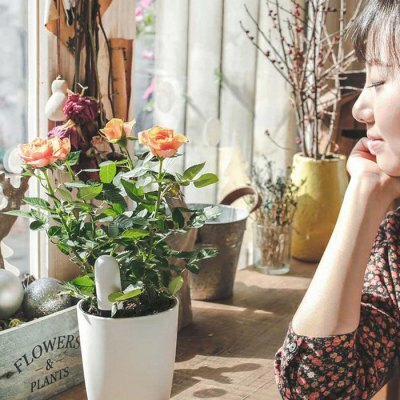 Now the neighbour can safely leave her green treasures to you on your next holiday thanks to the Xiaomi Mi Plant Sensor. Simply insert into the bottom of the potted plant and learn more about its condition. This 12.00 x 2.45 x 1.25 cm small everyday helper for people without green thumbs is connected to the smartphone and may save the plants on the windowsill. On the mobile phone screen with inserted sensor over Bluetooth everything important can be seen about the home plants like ph-value, temperature, lighting (if one irradiates) as well as soil humidity. Thus one knows in time when the plant must be watered the next time or if the exposure is too warm or cold for the plant. Ph value, temperature, lighting and soil moisture can be tracked on the smartphone. The MiHome app already contains most of the plants in the database, which will be followed by unknowns, so that your native floral splendour won’t wilt when you just look at them.